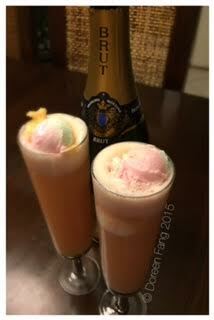 Ring in 2016 with some Champagne-Sherbet Punch! In a punch bowl add the pineapple juice, sparkling blood orange and champagne. Scoop sherbet into balls and add it into the punch bowl. Add ice if needed. Wishing you all a safe and Happy New Year! Love the color! What a fun idea =) Might have to try these! Thanks for the idea! This sounds nice for a first communion lunch, or bridal shower, or any other special occasion. Fascinating cocktails, I want to prepare them for the next anniversary of my marriage, it will be something special. Follow the link if you want to share some ideas about that with me. Fascinating cocktails, I want to prepare them for the New Year party, it will be something special. Thanks for the idea! This sounds nice for a first communion lunch, or bridal shower, or any other special occassion.